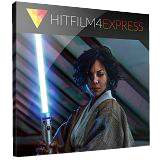 HitFilm 4 Express is the software to include all-in-one editing and professional visual effects backed up with a vast range of tutorials and unparalleled support. No other free product has multi-track video editing, advanced 2D and 3D compositing and over 100 effects. There is also Sci-fi adventure pack included: The force will be with you, always – as long as you’ve got this pack! Includes semi-automated lightswords, 3D laser blasts and 100% authentic opening title crawl. Usually $24.99 – you get it for FREE today! If you are a Mac user please download the installation file here (347 MB).